In the past fifteen years, file sharing of digital cultural works between individuals has been at the center of a number of debates on the future of culture itself. To some, sharing constitutes piracy, to be fought against and eradicated. Others see it as unavoidable, and table proposals to compensate for its harmful effects. Meanwhile, little progress has been made towards addressing the real challenges facing culture in a digital world. 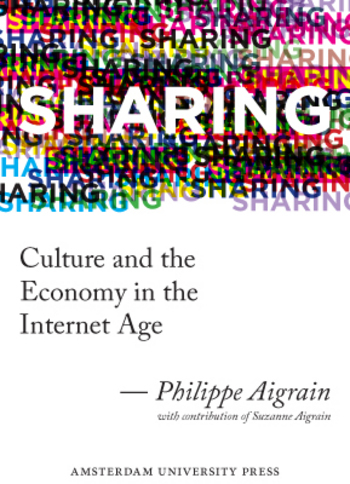 Sharing starts from a radically different viewpoint, namely that the non-market sharing of digital works is both legitimate and useful. It supports this premise with empirical research, demonstrating that non-market sharing leads to more diversity in the attention given to various works. Taking stock of what we have learnt about the cultural economy in recent years, Sharing sets out the conditions necessary for valuable cultural functions to remain sustainable in this context. Some reading impressions coming up soon. On the site sharing-thebook.com, you can access the source code and datasets used in the book, comment on each of the book chapters, run our economic models for the financing of a sharing-compatible culture with your choice of parameters, and run our diversity of attention analysis software on your own datasets. Durchaus. Aber da stecken einige Teufelchen in den Details. Noch etwas Geduld bitte. wie sieht es eigentlich mit dem „kombinierten Pilotprojekt Kulturflatrate/Kulturwertmark“ aus? Steht das immer noch für 2012 auf dem Plan?